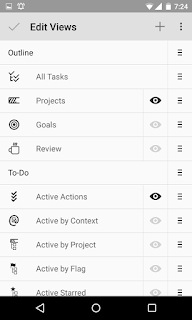 MyLifeOrganized for Android V2. Released! The MLO Team is glad to announce that MyLifeOrganized 2 for Android went live! We have started to release MLO 2 gradually in November, adding more devices day by day. And, from this moment, the new version is available for all the devices and users, both on our website and Google Play. 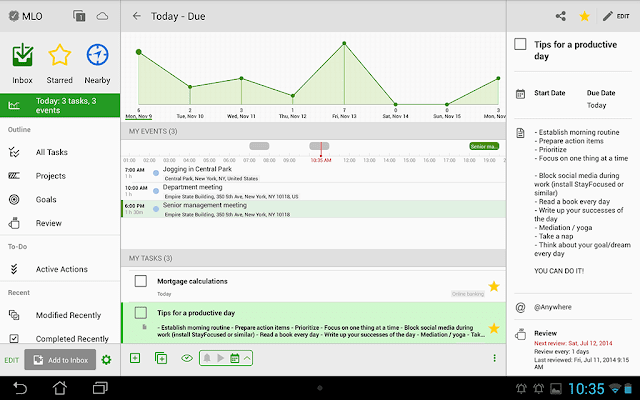 We can say with proud that the new MLO for Android is mostly as powerful, as MyLifeOrganized for Desktop. 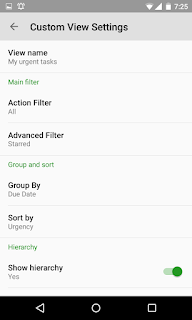 And this rich functionality is perfectly balanced with app usability, due to the all-new material design UI. From now on it is much easier to be mobile and productive at the same time! A couple of months ago we wrote the list of features, which the users would get in the new version. 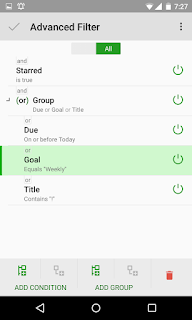 At that time we were not quite sure that we would have enough time to release the two main features from that list - editing of views on device and calendar view. We are happy to tell you that both of the functions are available in the released version! You can already see the full feature list and try all of this for free during 30-days trial. Calendar view became the fourth built-in view in MyLifeOrganized, after Inbox, Starred and Nearby. The calendar view shows the information about your tasks and events for the next few weeks in a graph form. It allows you to see the tasks that have a start date, due date or reminder on the day you’ve selected. As for events, they will be uploaded to the graph from the calendar on your device that you will choose. You will also see the duration of your events, which is marked with a special bar on the graph’s timeline. Tip: to import your custom views from the Desktop version, just follow these instructions. And now, it's time to meet the new version and feel its full power! Of course, we would appreciate your feedback about MLO for Android V2 very much! Please, do not hesitate and let us know, what you think. We also want to thank our beta testing team. Guys, you’re the best! With your help, we were able to create a great product, which can now make the life of so many people more organized. It shows only tasks that start or are due today, but ignores overdue stuff which are technically due on any given day they are over due. I could see the value of such a view if it displayed overdue tasks and let you reschedule overdue stuff (and currently due but not over due) to following days because it provides a workload view. Otherwise it is a completely worthless view; the few tasks that it does display is not a true representation of what is actually due! I can't seem to find the "Show In Outline" command in V2. Can anyone point me in the right direction? In MLO 2 you can do it easier. Just select a task in one view then select other view. If this task is found in the new view it will be selected. You can also use "smart arrow" in the toolbar to find your selected task quickly in a long list. Iam new to this blog. can you explain clearly the information about the android.Thanks for sharing.